After the implementation of Real Estate (Regulation and Development) Act, 2016 the real estate sector has bloomed to glory. As a mandate, the Real Estate Regulatory Authority were set up in many of the states, while others are still in the progress of setting up the same. However, owing to certain loop holes within the state departments which are handling the real estate matters, the entire mechanism of the act is being diluted. That is to say that the rampant corruption in the administrative departments coupled with abetment by the builders, is weakening the enforcement of RERA which was designed “as a life save for the home buyers”. Recently the Chairman of the Federation of Apartments Owners Association, Mr. S.K. Bahri, who is also the Central Advisory Council Member, RERA, Ministry of Housing and Urban Affairs, had written a letter to the Economic Advisor to the Ministry of Housing and Urban Affairs, Union Minister Hardeep Puri and Prime Minister Shri Naraendra Modi; voicing the problems faced by the home buyers on account of the corrupt actions of the state administrative departments which are neither appreciating nor regulating the purpose of the RERA Act. That these State administrative departments rather than helping out the home buyers are assisting the builder by not formulating the provisions of the act. 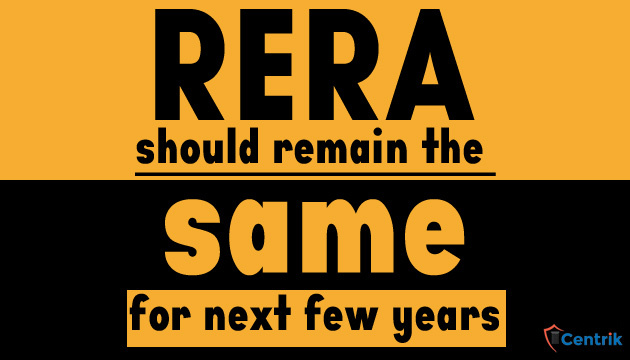 Further as per the letter, many home buyers have recommended that “no changes in the RERA Act be entertained for three years after all the states have notified their rules, appointed RERA administrators and tribunals which are in consonance with the letter and spirit of the Act as this will make developers and state administrators desist from diluting RERA”. The have also suggested that the model rules be formulated that includes penalties for officers of state administration who cause delay at any stage, prior to sanction or post completion of a project. To sum it up the home buyer want that timelines should be set at each stage, as the time formulation is the main cause of breeding corruption. The same issue was also discussed at the seminar recently held in the capital on the “Implementation of RERA Act”, wherein taking into consideration these issues the RERA chiefs of North Indian states have urged the ministry to rectify the difficulties by amending the act to curb the rampant corruption. However, the Union Housing and Urban Affair Minister, Mr. Hardeeep Singh Puri had made it clear that the provisions of RERA will not be tweaked at any cost. States that have tweaked their rules, they have to fall in line, otherwise the consequences would be very harsh. It can be well asserted that the Government is working hard to provide the benefit to the home buyers in every way possible even if it concludes fighting with the corruption. Already a reform can be seen in the real estate sector with the enforcement of the Real Estate (Regulation and Development) Act, 2016 and further with more positive reforms a new face of real estate sector free from all encumbrances will evolve.